1Chest Departments, Faculty of Medicine, Zagazig University, Egypt. 2Chest Departments, Faculty of Medicine, Zagazig University, Egypt. 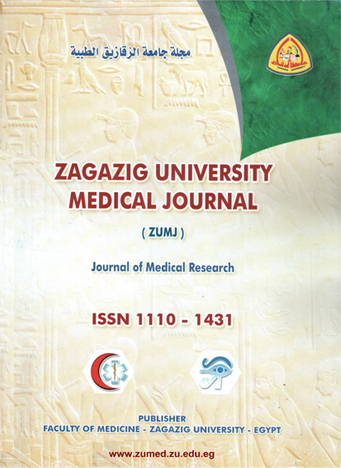 3Clinical Pathology Departments, Faculty of Medicine, Zagazig University, Egypt. Introduction: Tuberculosis (TB) remains a major global health problem. Interferon-inducible Protein-10 (IP-10) has been proposed as a promising biomarker for monitoring the efficacy of standard therapy in patients with active pulmonary TB. Objective: The propose of this study was to assess the efficacy of IP-10 in patients with active pulmonary TB as a sign of a response to TB standard therapy. Patients and methods: A total of 136 newly diagnosed pulmonary tuberculosis patients were recruited in this study. The patients were classified into 2 groups according to the presence of the risk factors of relapse. Group (1) included 30 patients with low risk of relapse and group (2) included 25 patients with moderate and high risk of relapse. In this study, we assessed the IP-10 levels in both serum and in response to QuantiFeron-TB Gold In-Tube test (QFT-GIT) antigens at time of diagnosis, at month 2 and after completing treatment. Results: IP-10 median levels in both serum and in response to QFT-GIT antigens were not significantly different between both patient groups at baseline, at month 2 and after completion of TB treatment. However, in each patient group, medians of IP-10 levels before treatment decreased significantly with time at 2 months and after the completion of anti-TB treatment (all P < 0.05). Conclusion: Interferon-inducible Protein-10 (IP-10) in serum or in response to QFT-GIT antigens was a useful biomarker for monitoring the efficacy of the standard regimen in patients with active pulmonary TB.